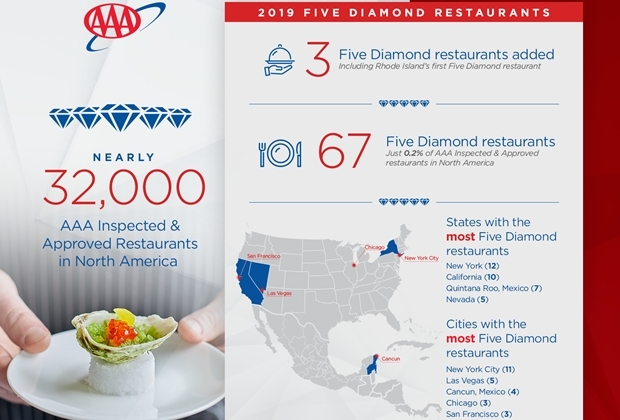 The Auto Club also announced AAA Four Diamond restaurant ratings, including The Steakhouse in Rancho Mirage, which earned its first AAA Four Diamond rating. Just 0.2 percent of the more than 32,000 AAA Inspected & Approved restaurants are Five Diamond-rated restaurants. To qualify for the rating, a restaurant will consistently provide leading-edge cuisine of the finest ingredients, uniquely prepared by an acclaimed chef and served by expert service staff in extraordinary surroundings. High-end restaurants are adopting simple, streamlined décor and thanks in part to the popularity of cooking shows and competitions, some continue to highlight lively open kitchen designs that allow guests to watch and even interact with culinary staff. The AAA Diamond rating system provides consumers with the broadest coverage of any U.S. rating system, geographically and by number of properties rated, including the United States, Canada, Mexico and the Caribbean. The Auto Club’s full-time inspection staff reviews Southern California restaurants. The inspectors bring prior hospitality industry experience to the association to give members effective, consistent evaluations that can be used to select the restaurant that meets their travel desires.